Affordable Sample Rate Conversion in a PCIe form factor! Lynx Studio Technology's AES16 192 kHz Multichannel AES/EBU Interface integrates digital consoles, multi-channel A/D and D/A converters, and hard disk recorders with computer-based workstations. 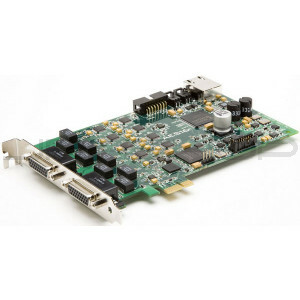 The AES16 offers unprecedented AES/EBU channel capacity and routing flexibility in a single PCIe card format. With support for up to 16 channels of input and output at sample rates up to 192 kHz, the AES16 turns your computer into a powerful digital router or patchbay with extensive flexibility with minimal cabling. Most importantly, the AES16 supports the emerging single-wire 192 kHz standard and is compatible with existing dual-wire AES/EBU devices. Up to four AES16's can be installed in a single computer. Offering a solution for jitter problems in AES signals, the AES16 incorporates a new Lynx technology called SynchroLock that provides extreme jitter tolerance at all inputs. By coupling statistical analysis with low-noise clock generation techniques, SynchroLock is able to extract a very clean clock from AES signals affected by long cable lengths and other noise sources. The clock output of SynchroLock can also be used as a very accurate word clock source for other studio devices. Glitch-free recording and playback is assured due to the AES16's large on-board buffers and extremely efficient zero-wait state DMA engine. These features provide tolerance to system latencies and significantly reduce load on the host CPU. Data transfer hardware and software are highly optimized to provide extremely low latencies for ASIO and other real-time applications. The AES16 includes an LStream expansion port for increasing its I/O capabilities. Connecting a Lynx LS-ADAT adds multi-channel ADAT lightpipe I/O and supports format conversion between AES/EBU and ADAT. The AES16-SRC model offers eight channels of mastering quality sample rate conversion to accommodate studios running multiple samples rates or signals not locked to "house sync". The on-board digital mixer offers flexible patch-bay style routing and digital mixing. Zero Latency 32-channel/32-bit digital mixer with 16 sub outputs. Multiple dither algorithms available per channel.